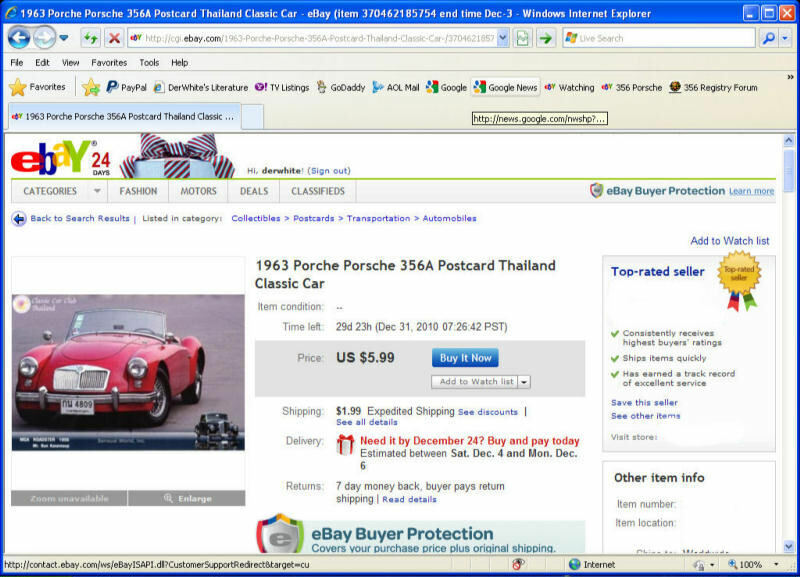 What follows is a chronicle of some of the most interesting and highest-priced 356 Porsche related items offered for auction on Ebay over the past several years. 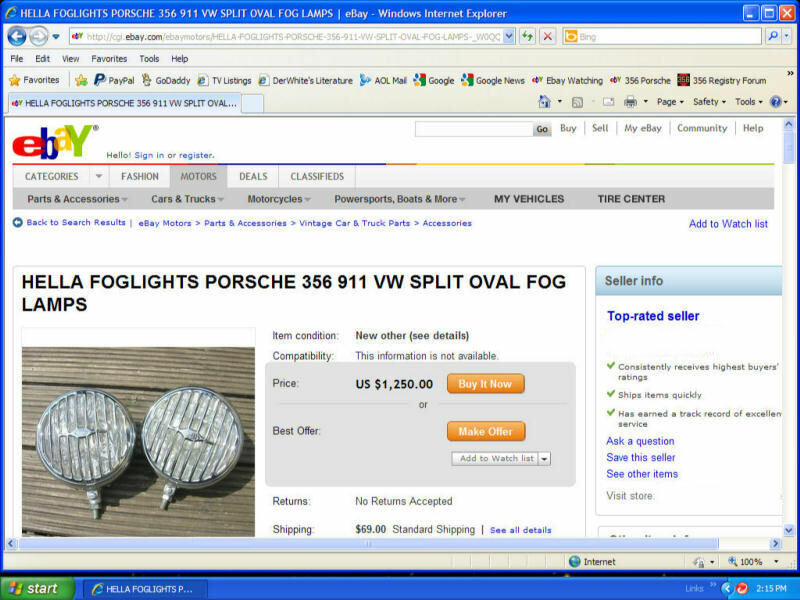 Included are some really wierd items not really suitable for 356 Porsches, and items with some very high prices! 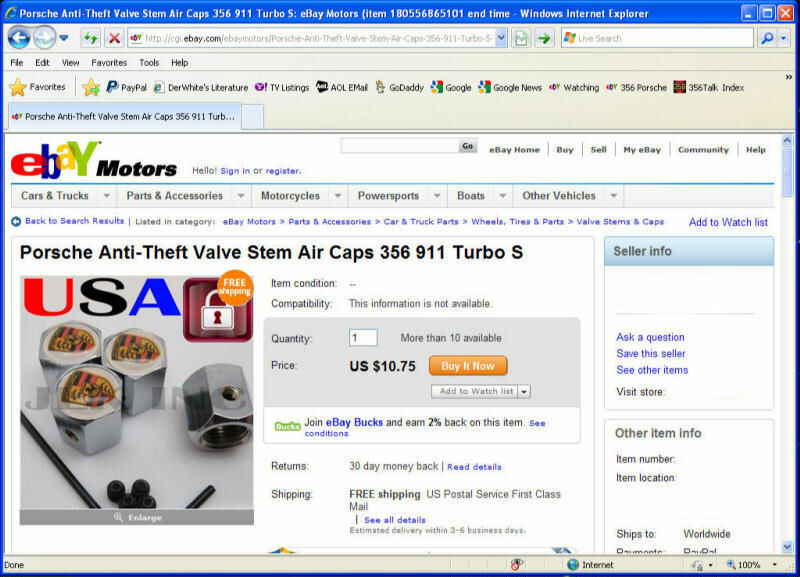 Ebay is a free-for-all! 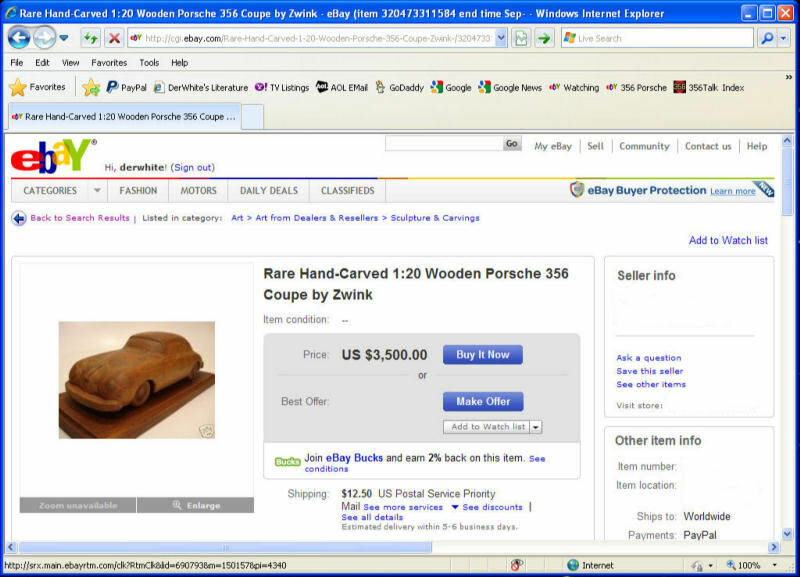 Some Sellers ask very high prices! 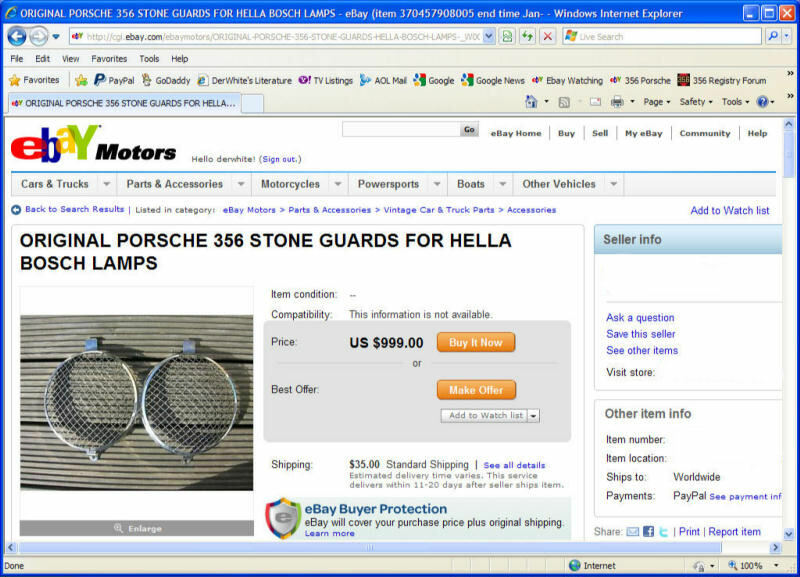 Most of these don't sell. 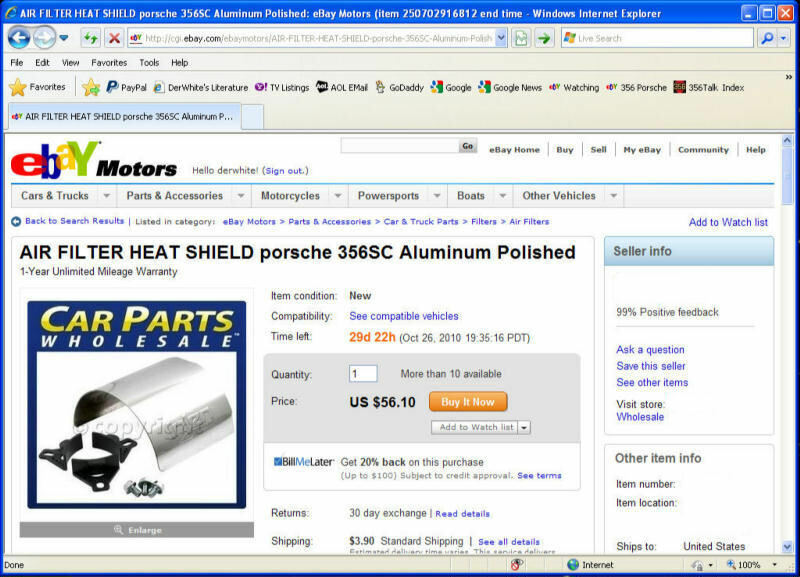 Many of these high priced items can be found at much lower prices at your favorite 356 Porsche parts seller. 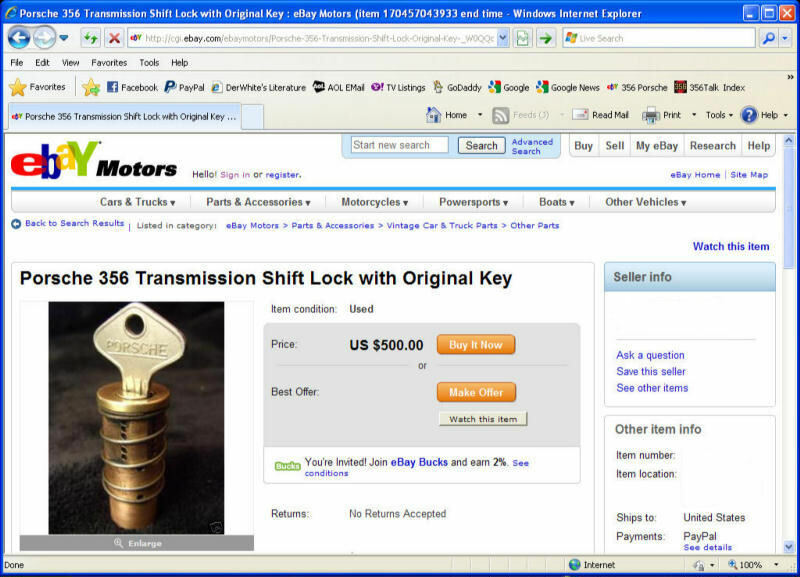 So have a chuckle and check out the following examples. 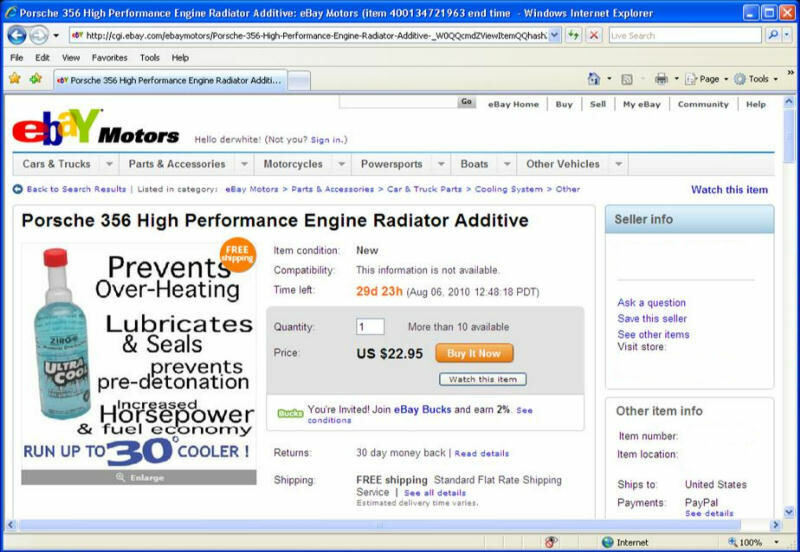 This website will be added to periodically! Check back and see! 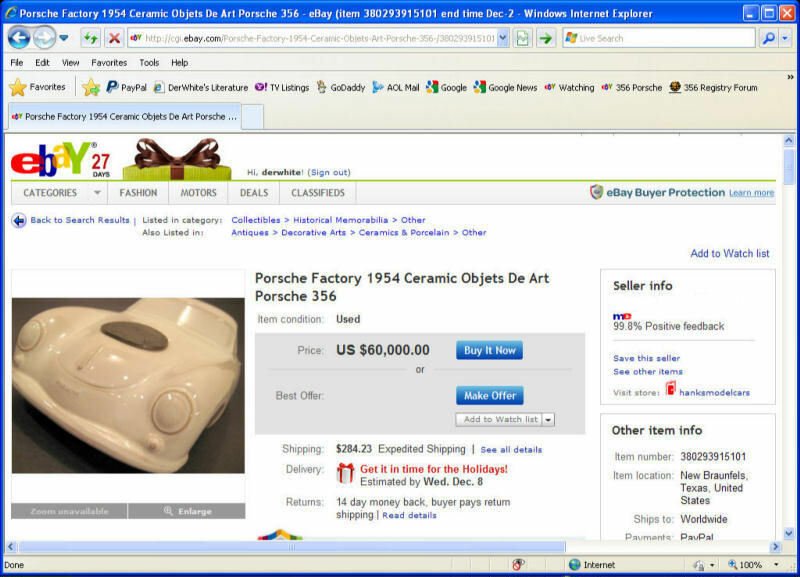 For the price of this Object-de-Art, you could buy a really nice full-sized 356 Porsche! 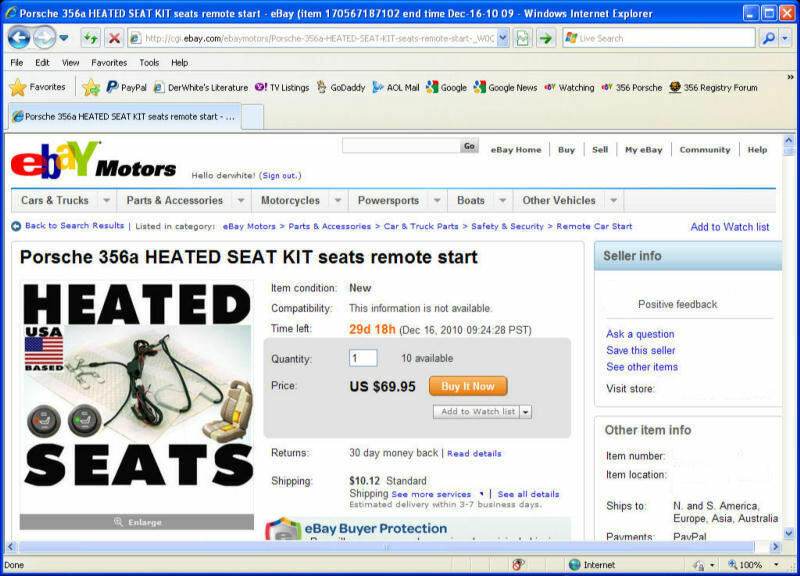 Heated Seats..........In a 356-A Porsche? 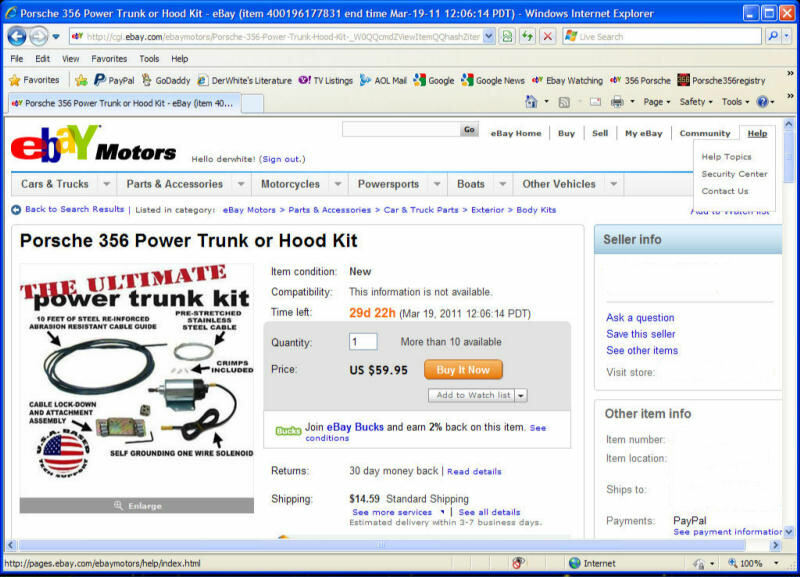 I'll bet this set is 12 Volt, won't work in most 356-A's! 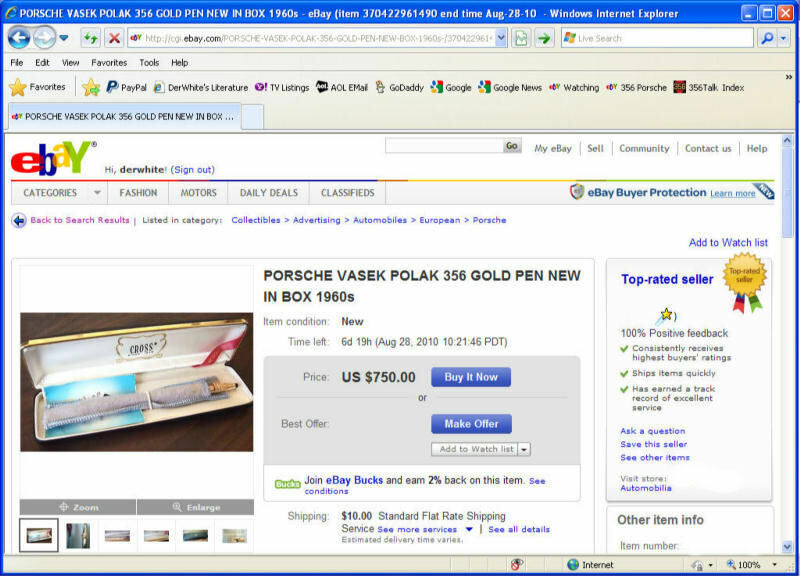 That's a Brumm 1/43 scale Porsche model, and a $12 Onyx Trophy Pen Set. 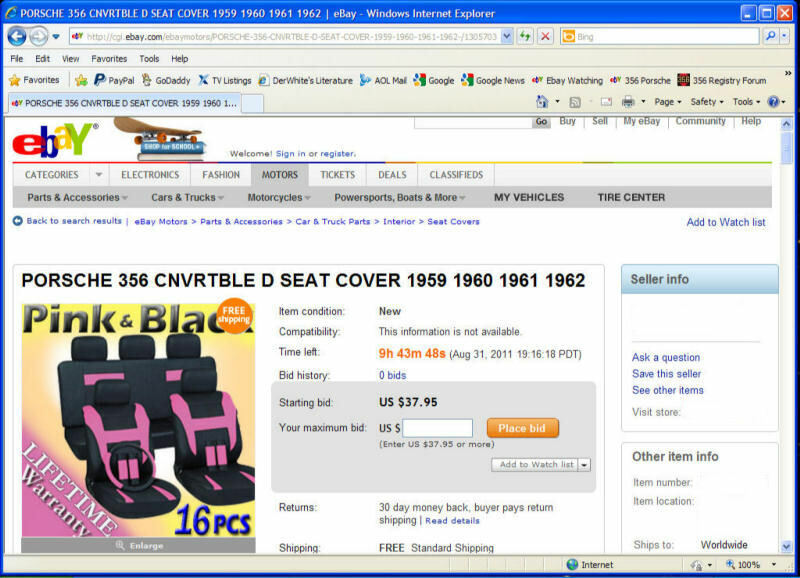 Total Cost probably under $25.00! 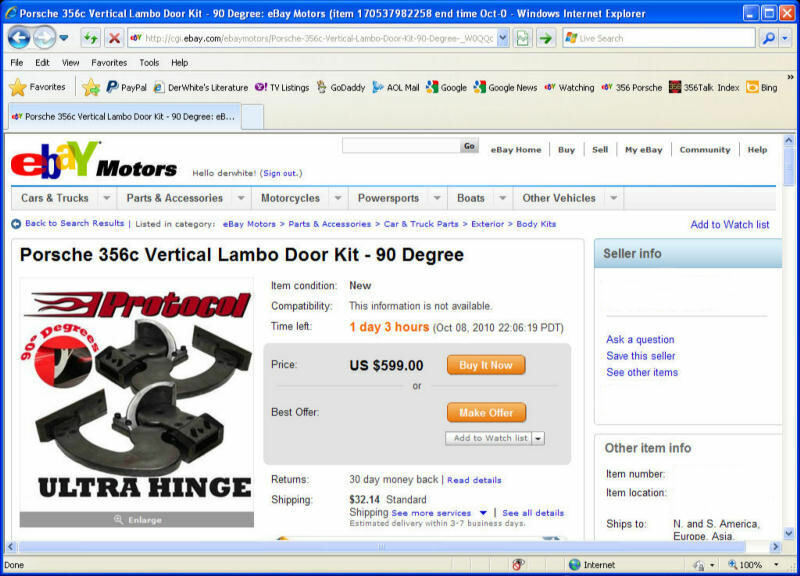 Never have seen a Lambo Door on a 356 Porsche! 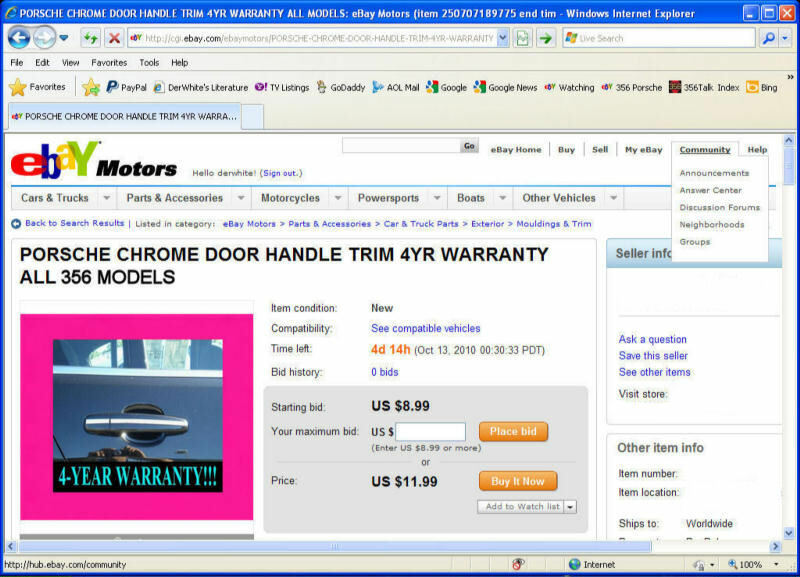 And the Seller didn't provide any Pictures of this accessory installed! 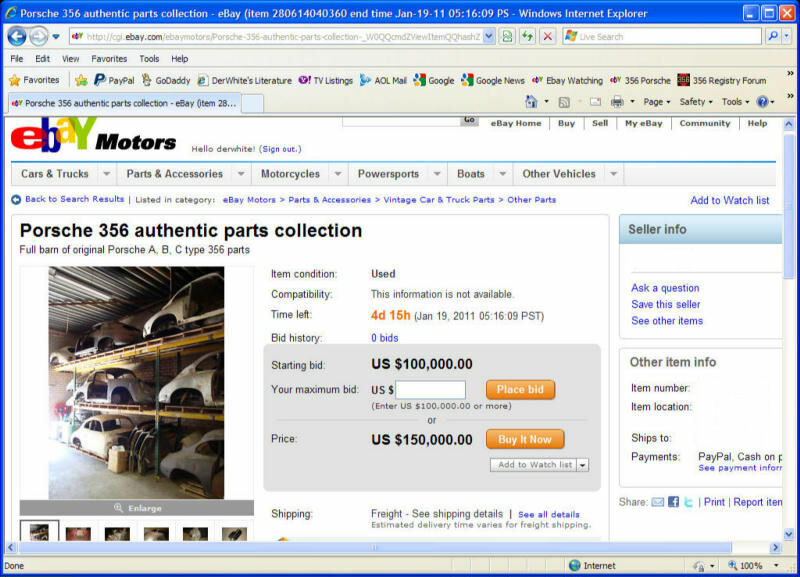 Now here's an interesting price! 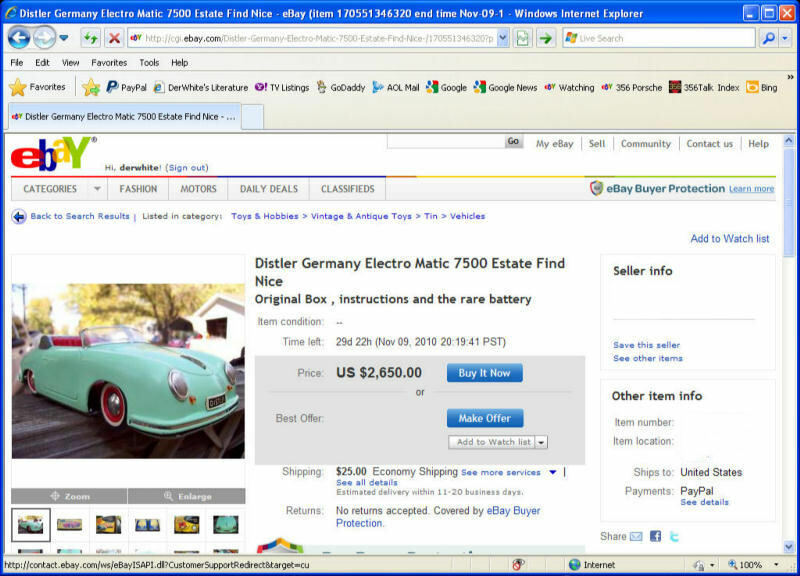 Love that Lime Green on a 356 Pre-A.............!!! I think he had his "A's" mixed up! 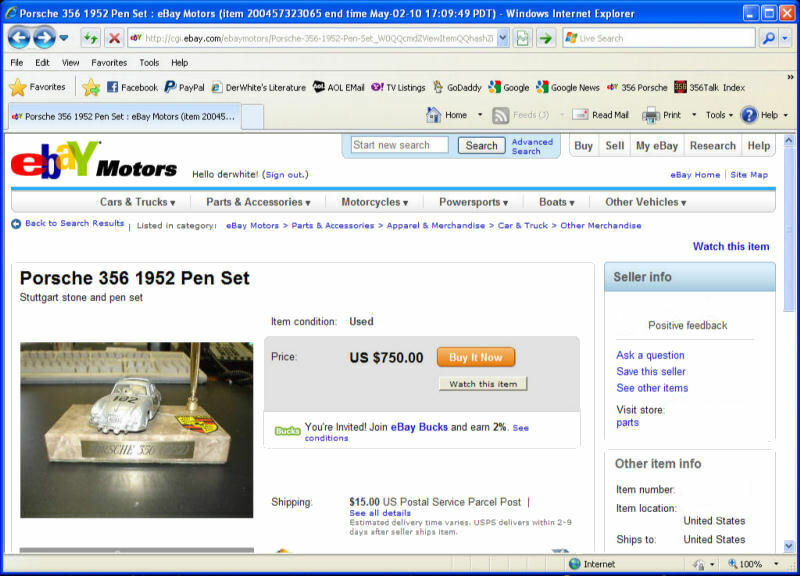 MGA and Porsche 356A! 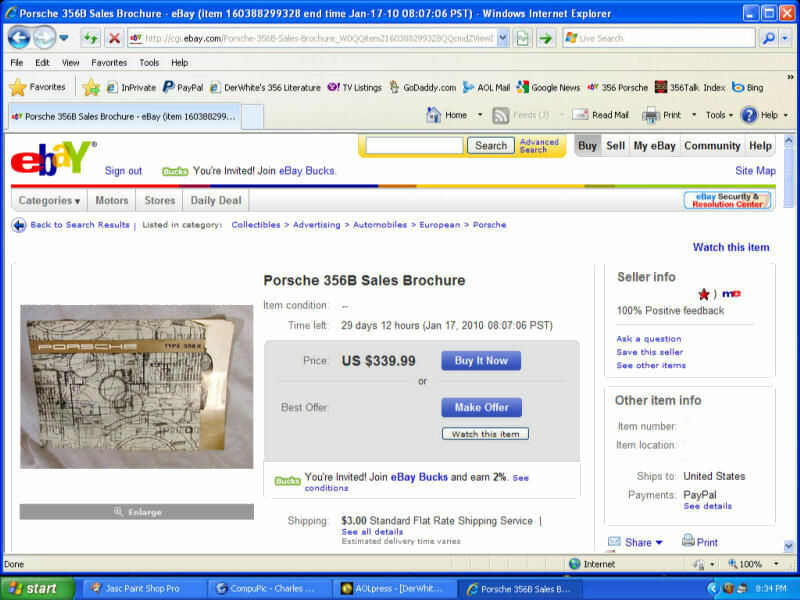 Price is a little high for a 356-B Brochure in this condition!!! 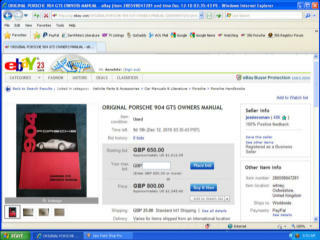 This Price is REALLY Expensive! 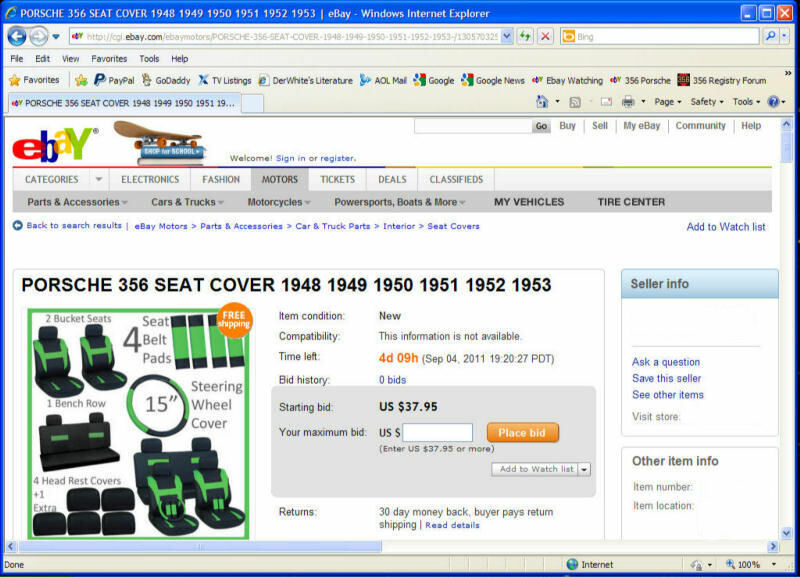 This item is out of the 1960's Hot Rodding! 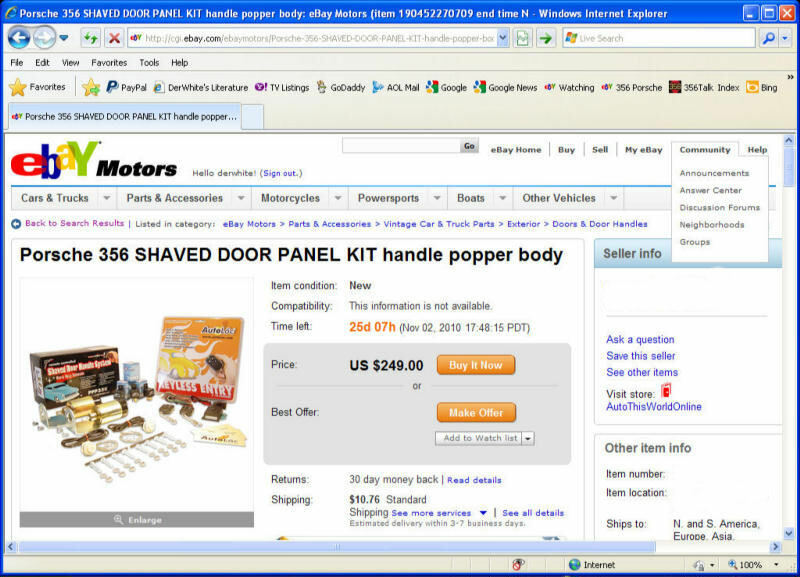 Eliminate your door handles with an electric push button! 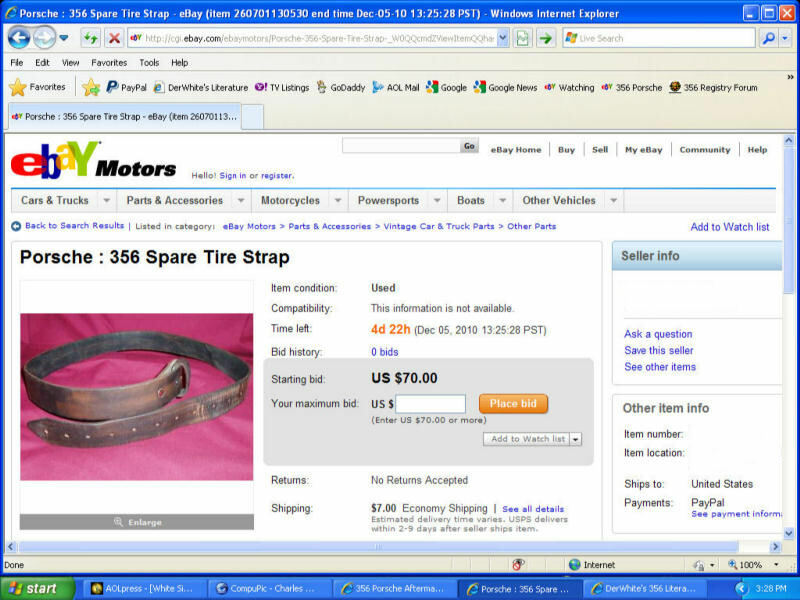 This looks a lot like an ordinary leather belt!!! WHERE are you going to put all this stuff? 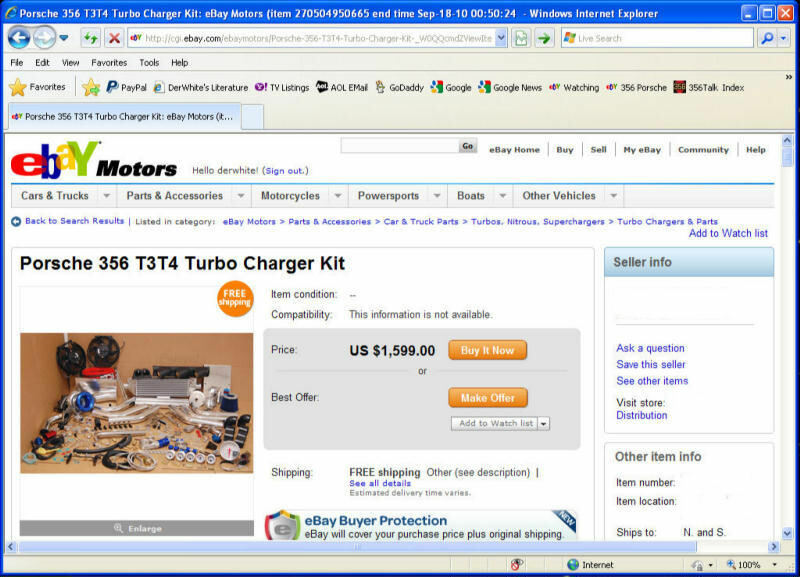 In the Engine Compartment? Someone show me a picture! 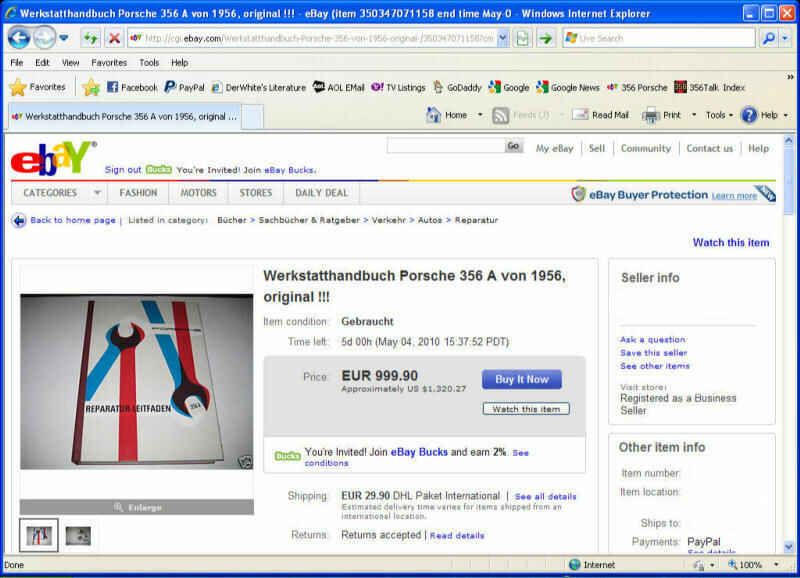 That would be one of the Most Expensive Distler Porsches I've seen! 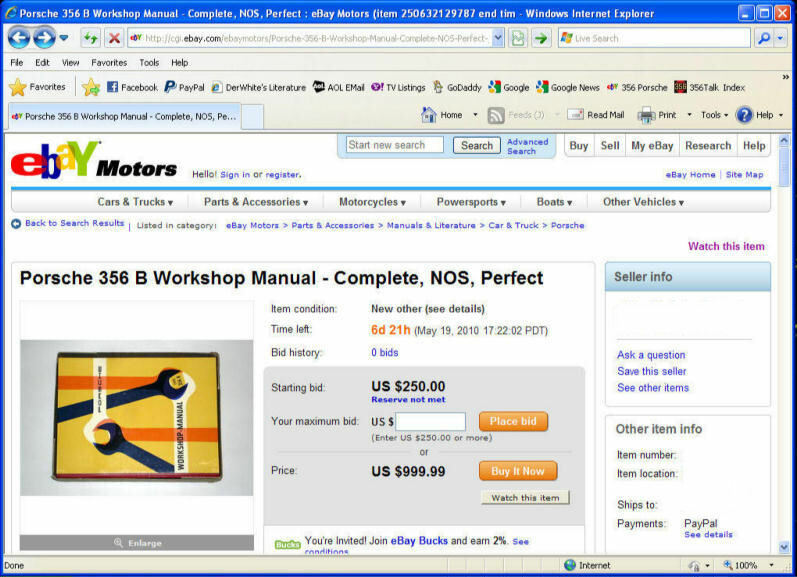 It may be priced right, but WHAT is it? 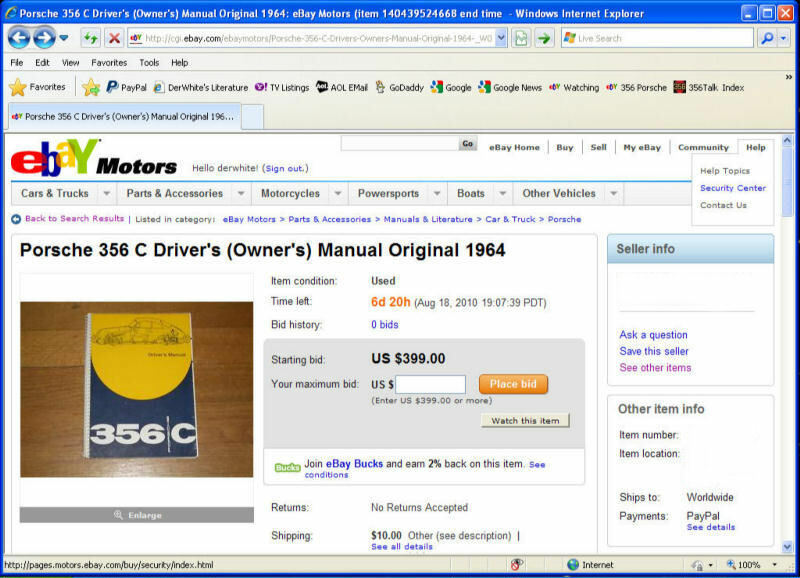 This one has been cycled on Ebay at least five times! 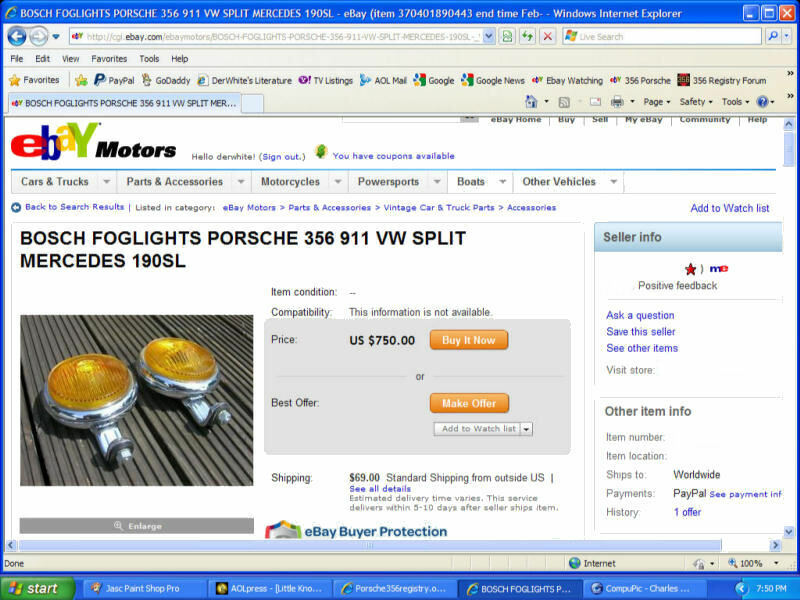 These look like Dual Boat Propellers! 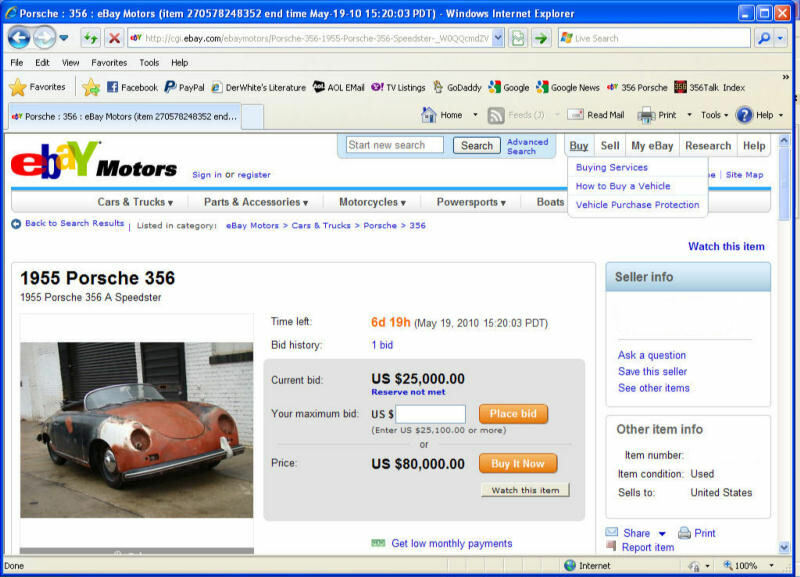 Where do they fit on a 356-A? 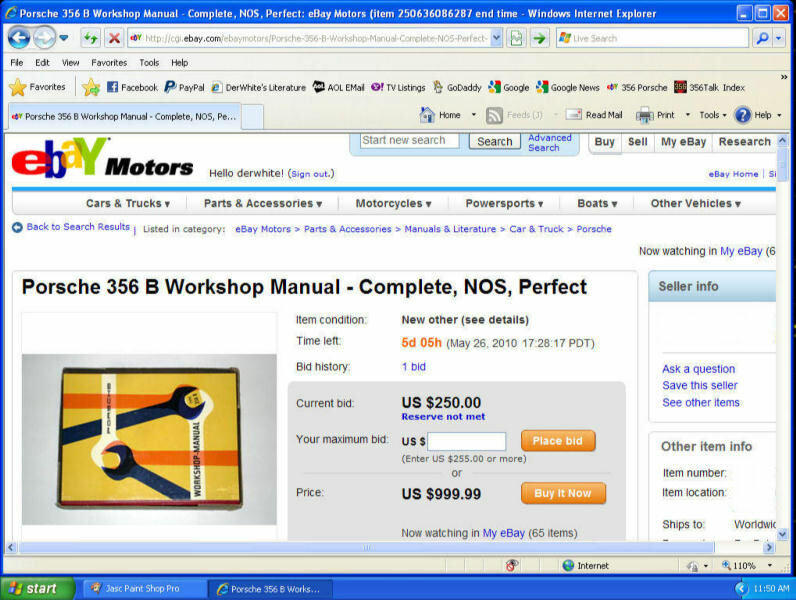 A 356-A Factory Workshop Manual in German for $1,320.00!!! 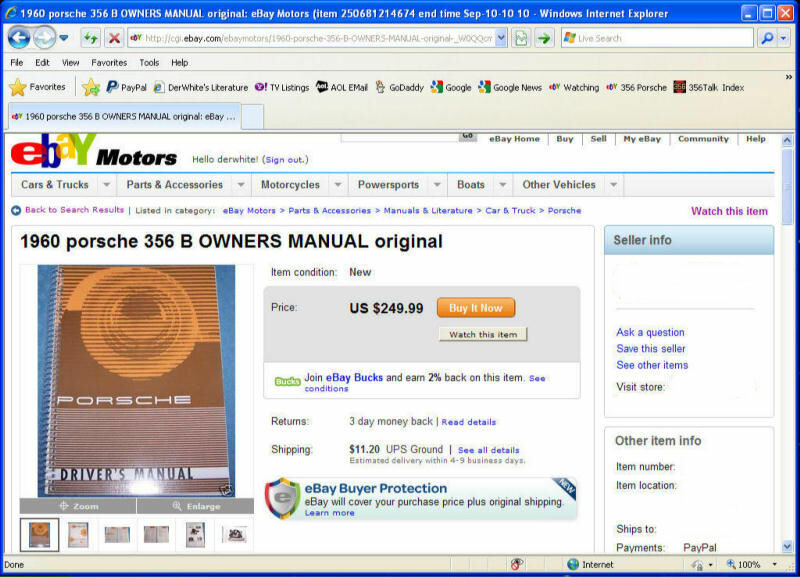 Another 356-A Workshop Manual and Supplement for $1,100.00! 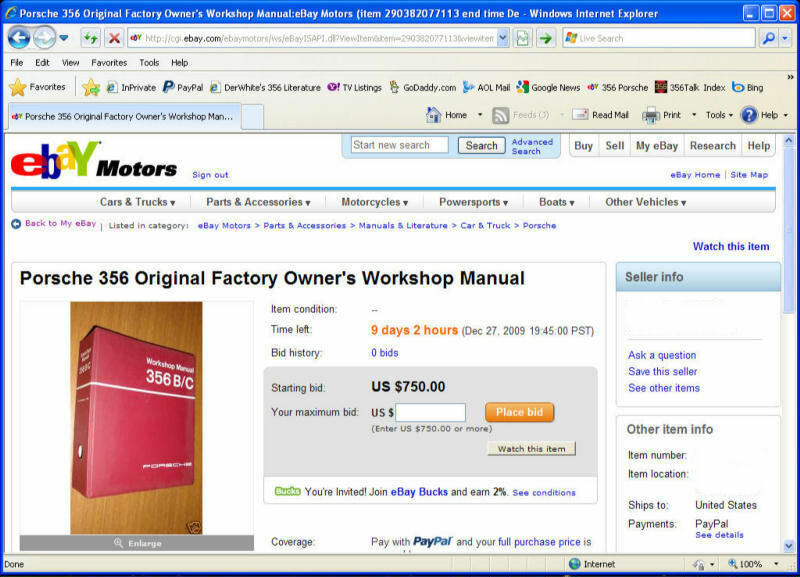 356-B Factory Workshop Manual for $999.99!!! 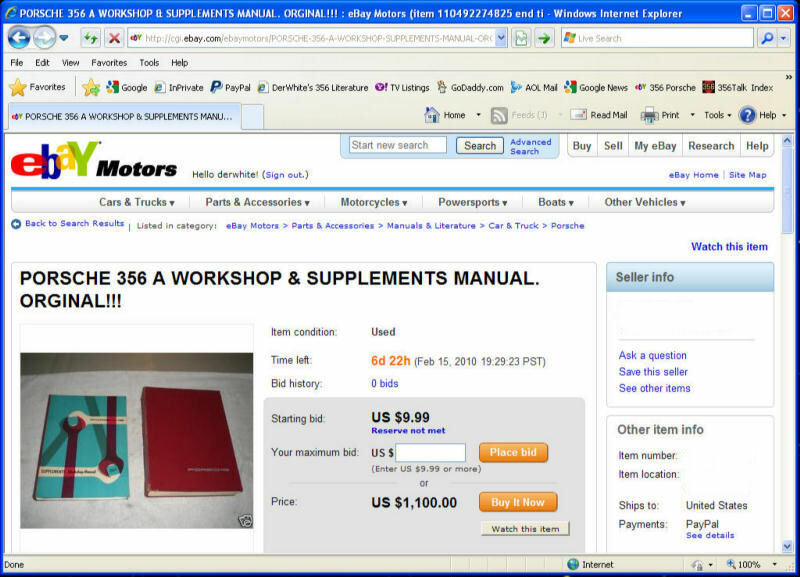 $856.35 for 356-B Manual and Supplements!!! 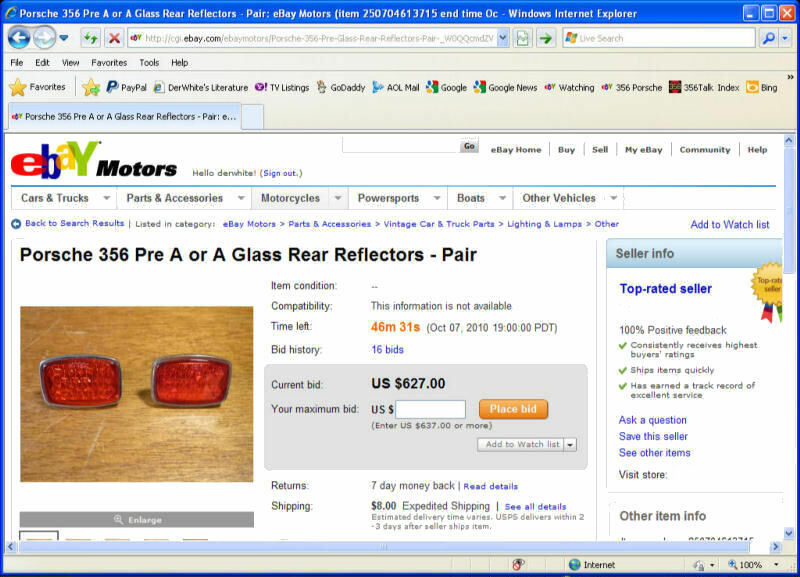 This is close to twice the going rate! 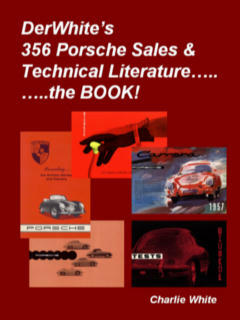 356-A Parts Book (soft cover) only Eur 699,90...................or $923.87!!! 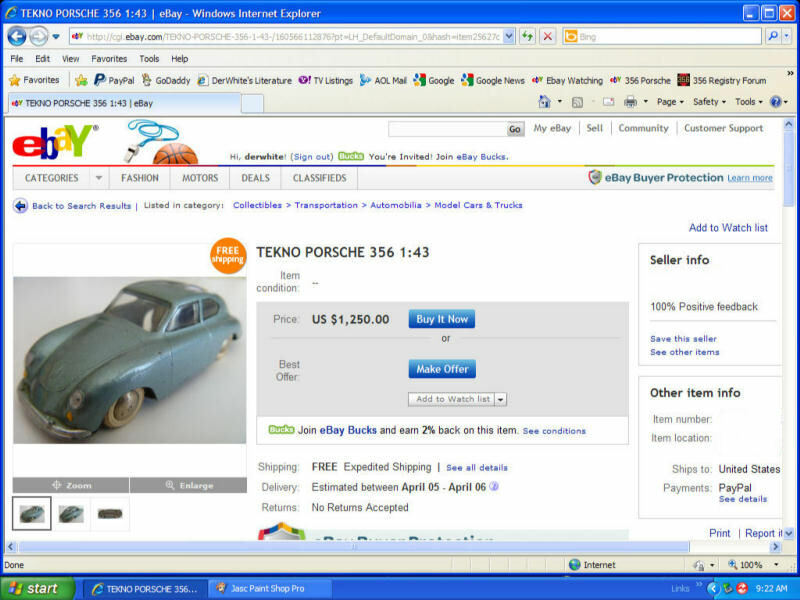 Tekno Porsche 356 1:43............BOX ONLY...........$850.00!!! 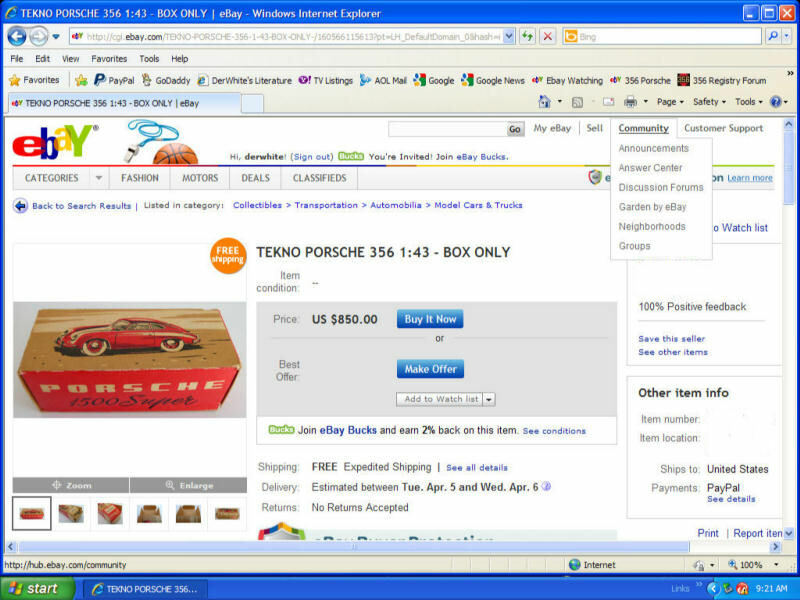 And here's the TEKNO 356 1:43 Model to go with it..................ONLY $1,250.00!!! 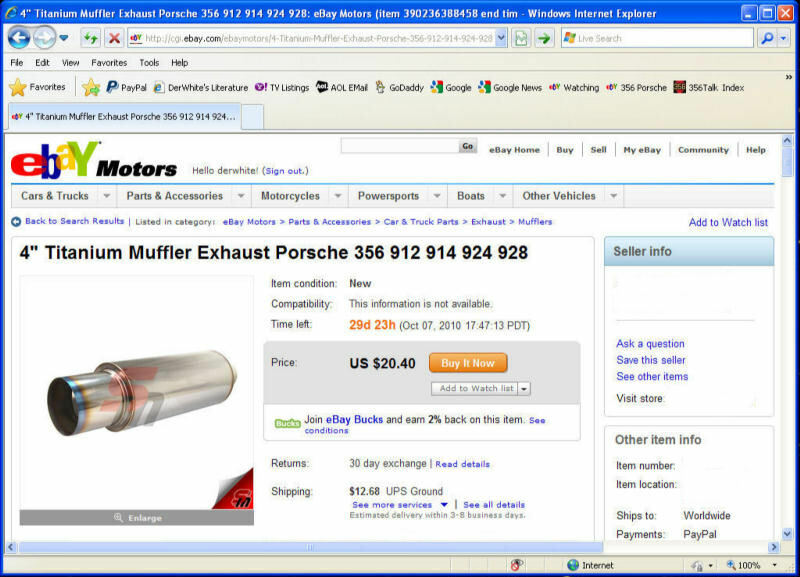 I simply cannot visualize where this part goes on a 356 Porsche? What say you? 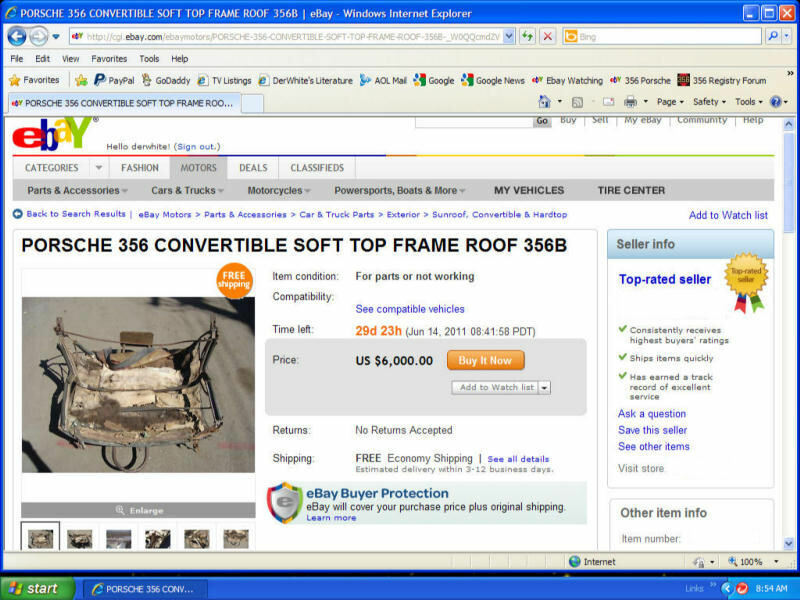 Convertible top for a 356-B............$6,000.00!!! 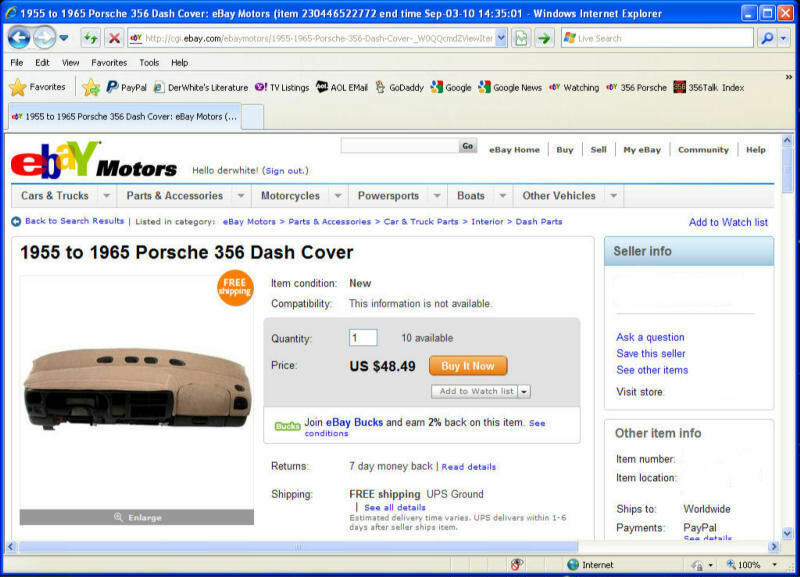 Is there REALLY much of a dash to cover on a 356 Porsche? 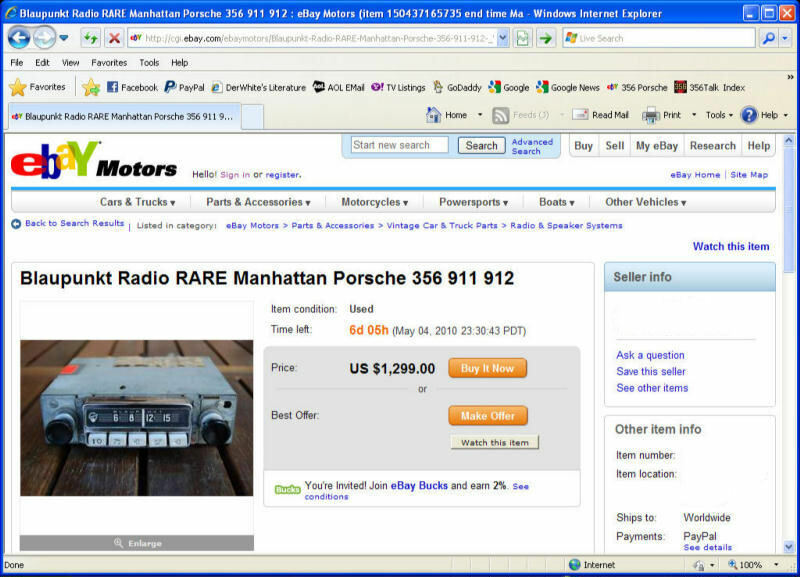 For this price, it should be a NOS in the box Blaupunkt US AM/FM/SW Signal Seeking Koln Radio! 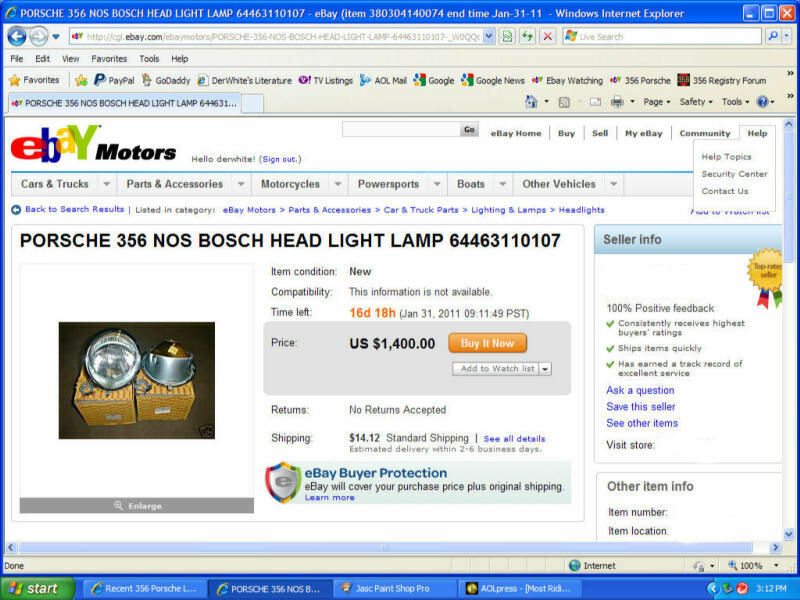 Pair of Headlight Assemblies for $1,400.00!!! 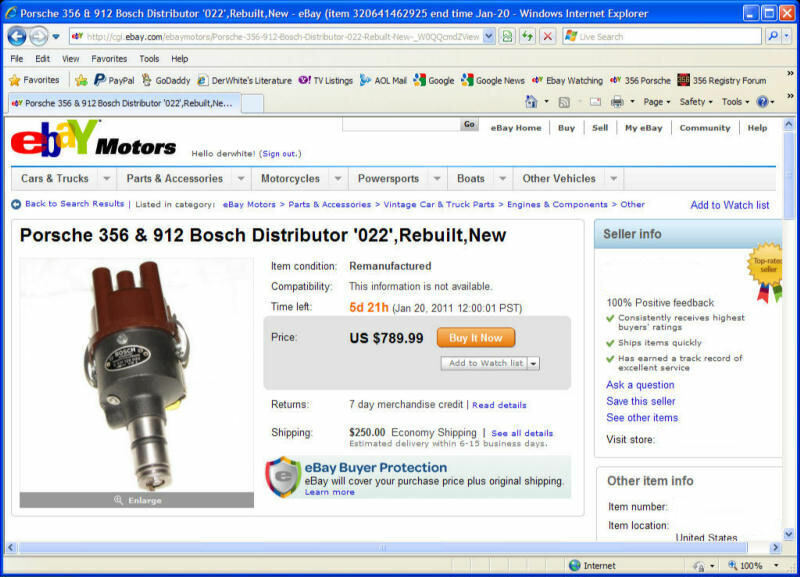 'O22' Bosch Distributor for $789.99!!! Show me a picture of one installed! 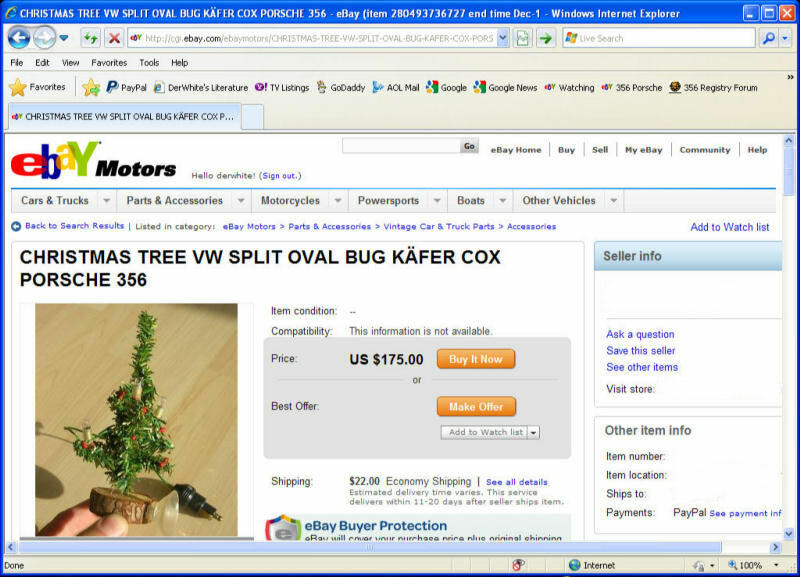 I wonder if this SOLD! 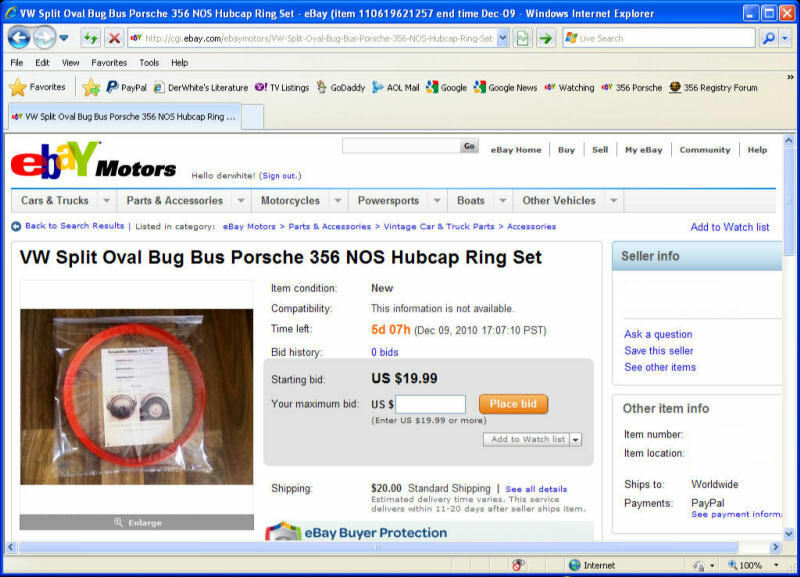 For the 356 Porsche owner who has EVERYTHING! 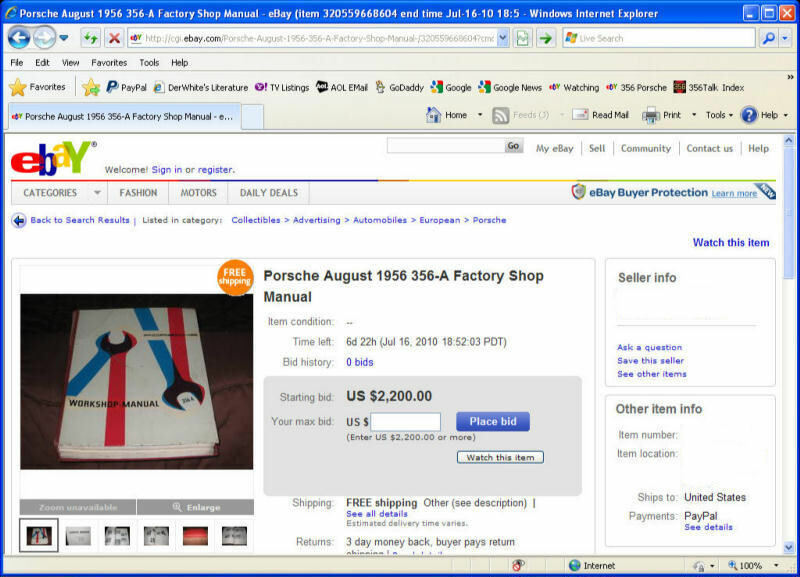 $2,200.00 Starting Price for a USED 356-A Workshop Manual! 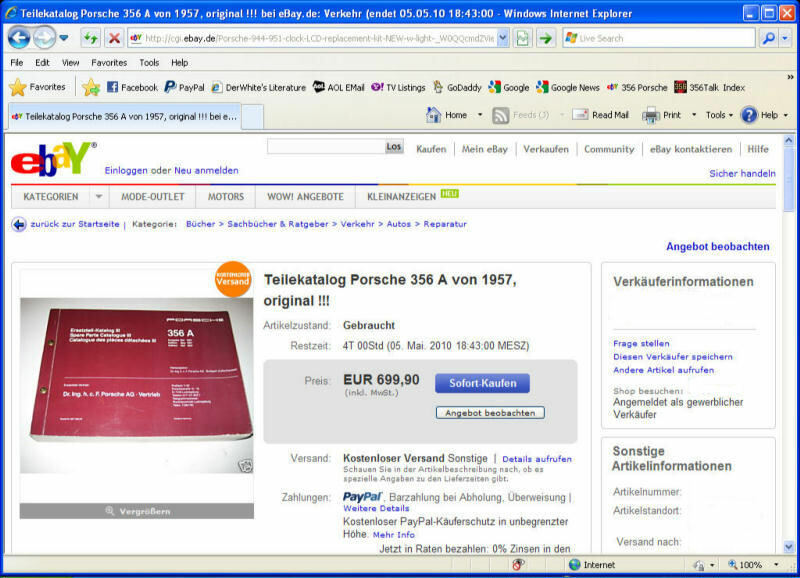 A 356 Porsche related Ebay Auction that doesn't apply to an air cooled 356 Porsche! 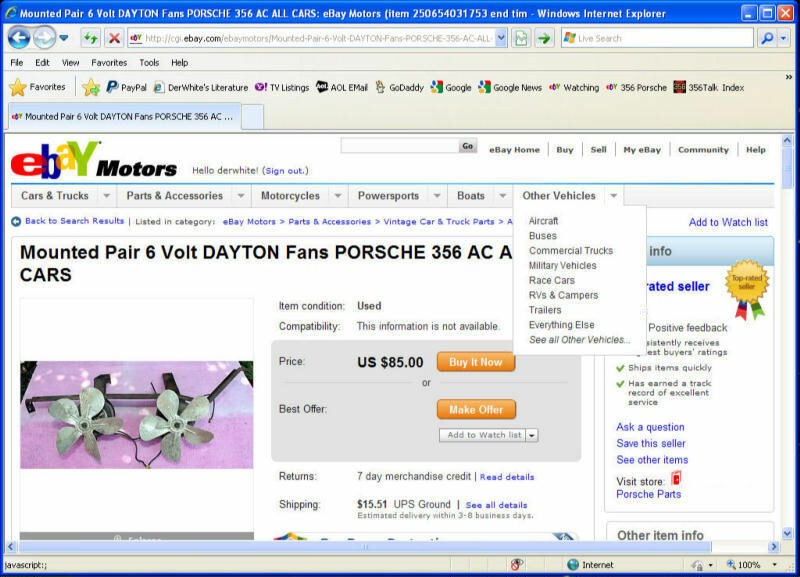 Check closed Ebay sales for Distler Porsche Prices! 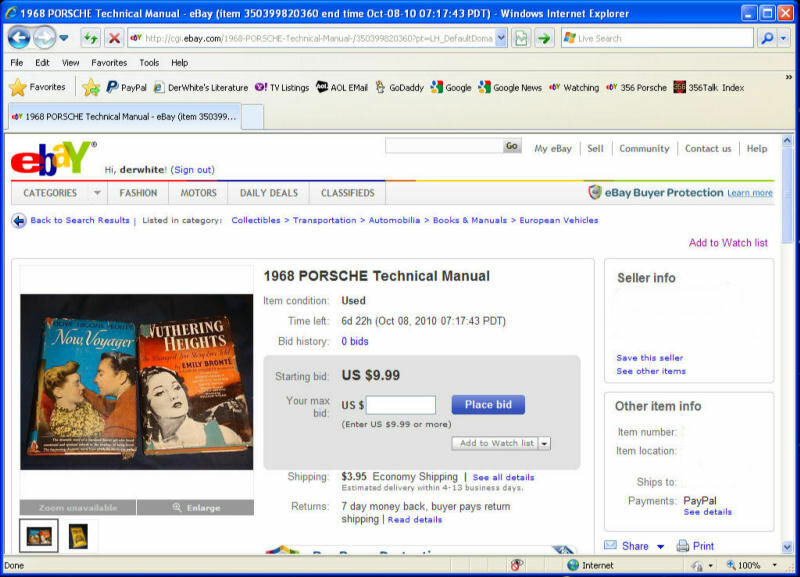 Has the Seller actually installed one on a 356? Would like to see pictures! 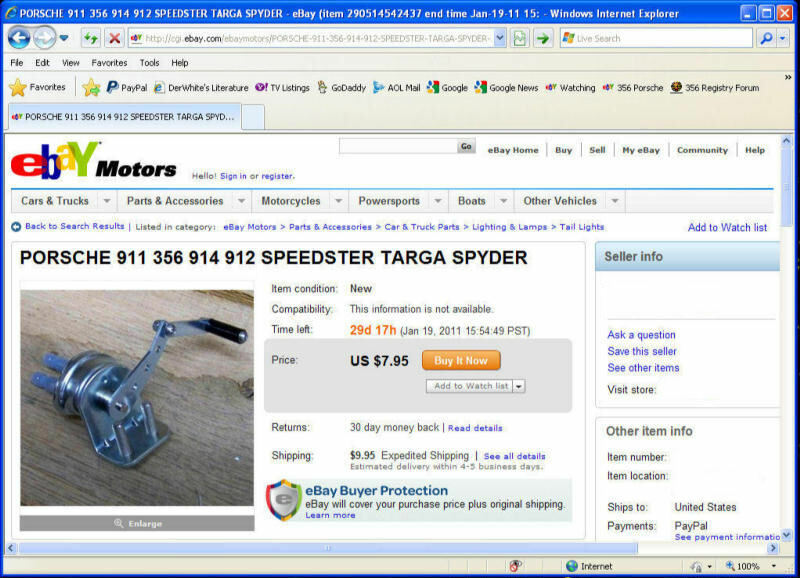 I actually saw one of these recently......................on a Plastic Speedster!!! Here's a couple of manuals I don't have in my collection! 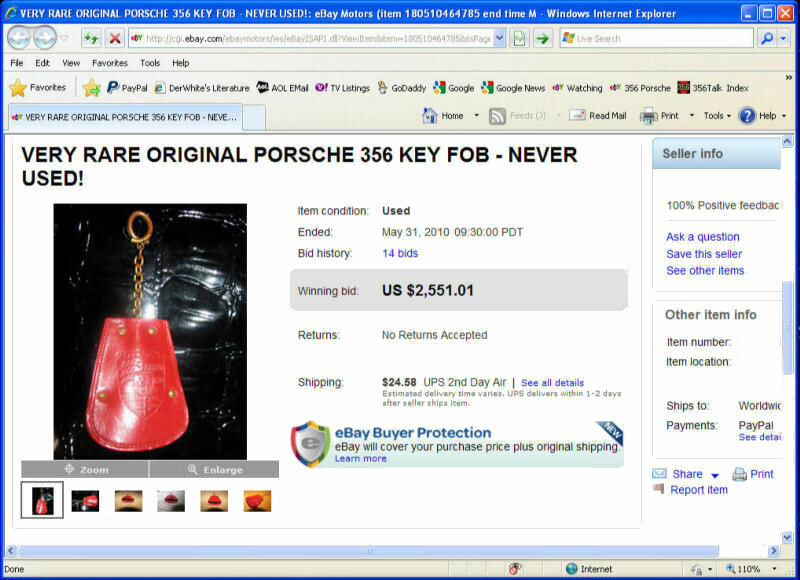 I guess this is a red ring for around the hubcap? Price is right! 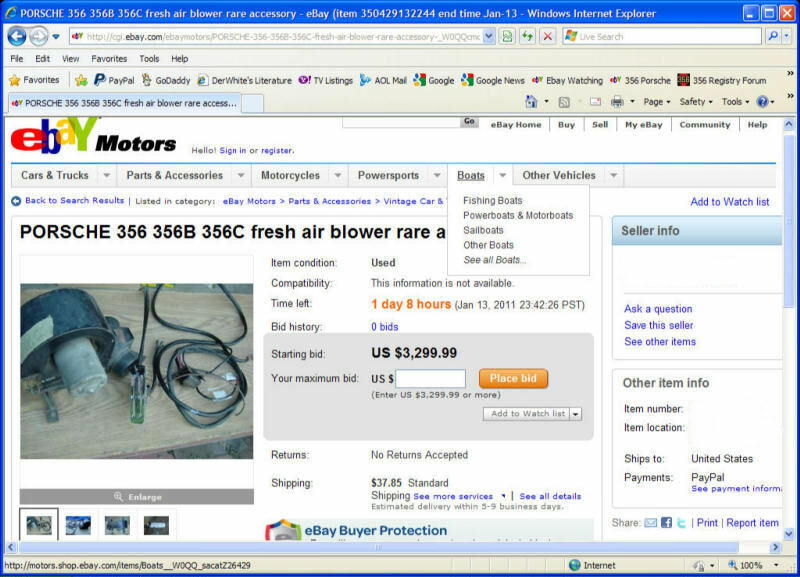 This is an original factory accessory fresh air blower............for $3,300.00! 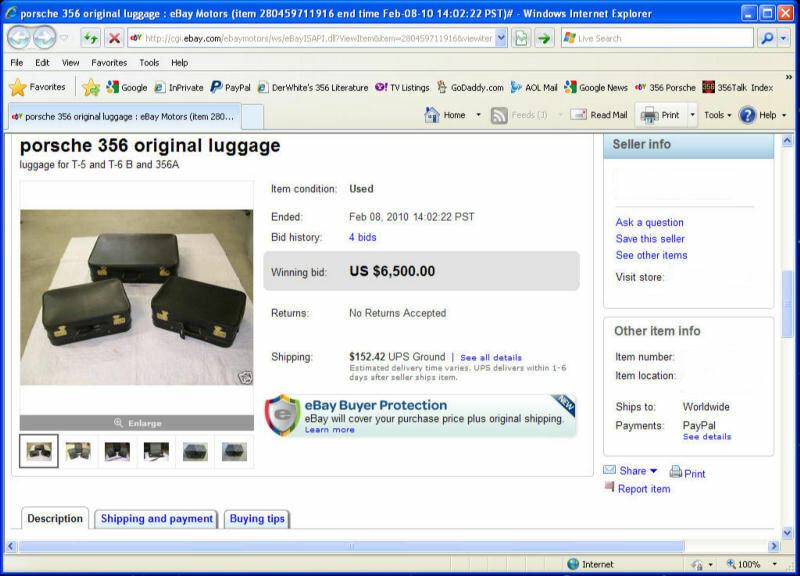 This factory accessory luggage has really gotten expensive. 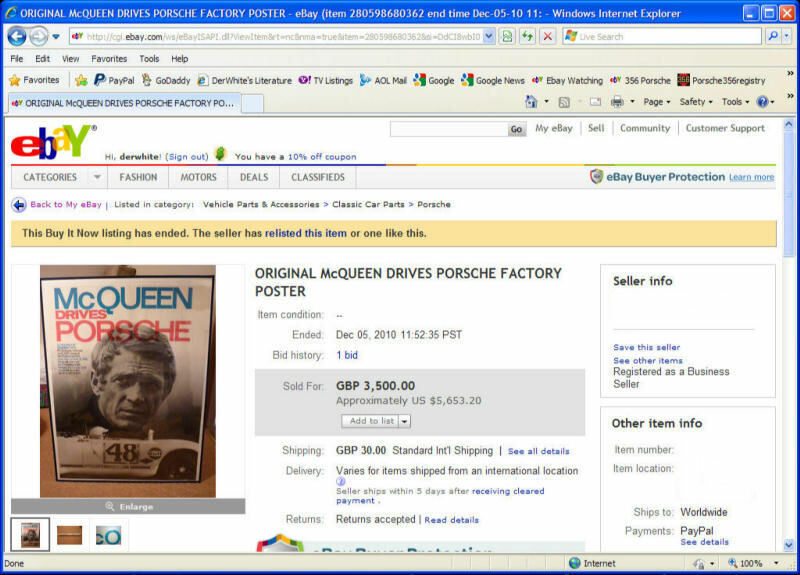 That's more than you'd have paid for a 356-C NEW! 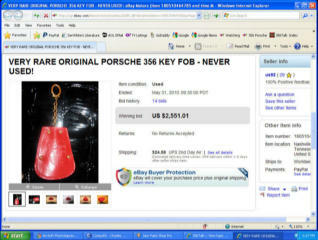 Most 356 Porsche door handles are already chromed! 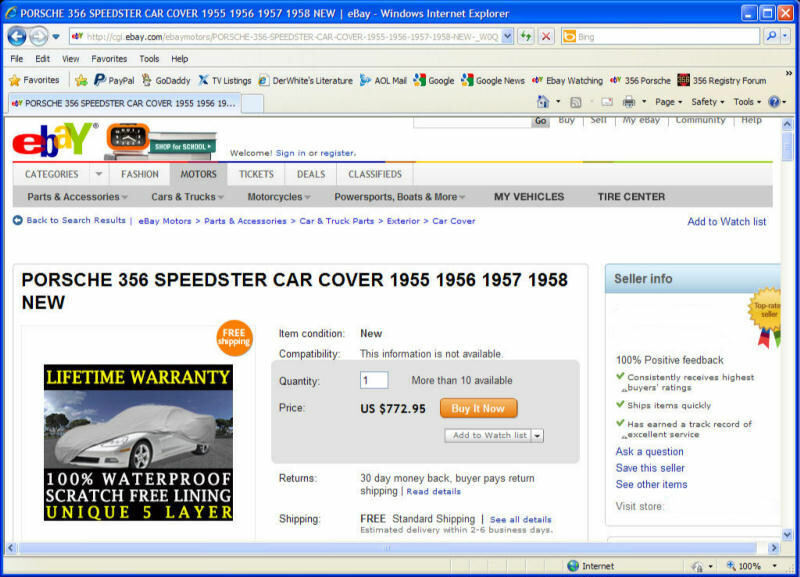 I'm glad it's "Mint in Box" for that price!!! 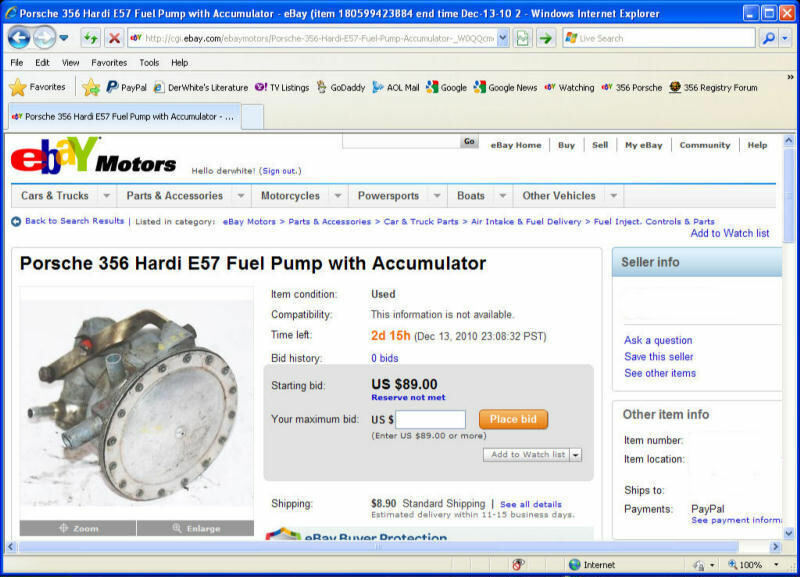 What is a 356 Porsche Hardi E57 Fuel Pump Accumulator? 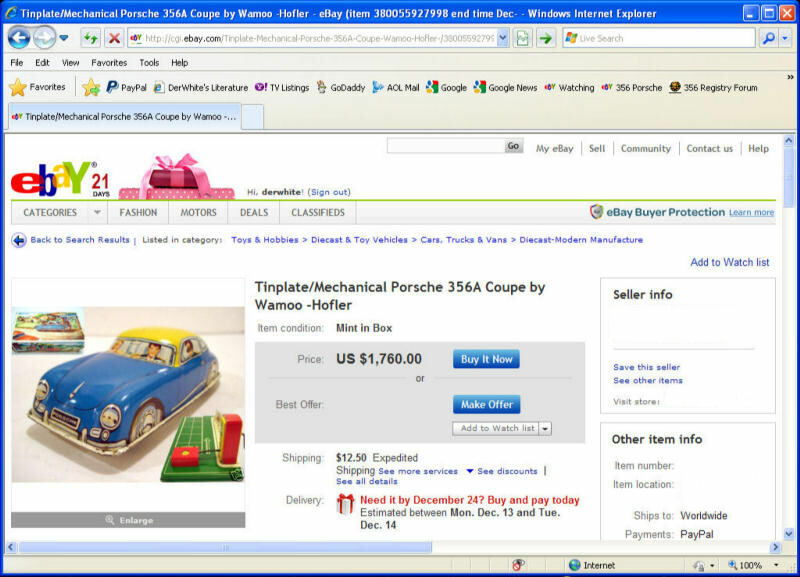 This model is only about 3.5 inches long!!! For the ULTIMATE CONCOURS NUT..........a zip-up bag for that extra quart of oil!!! 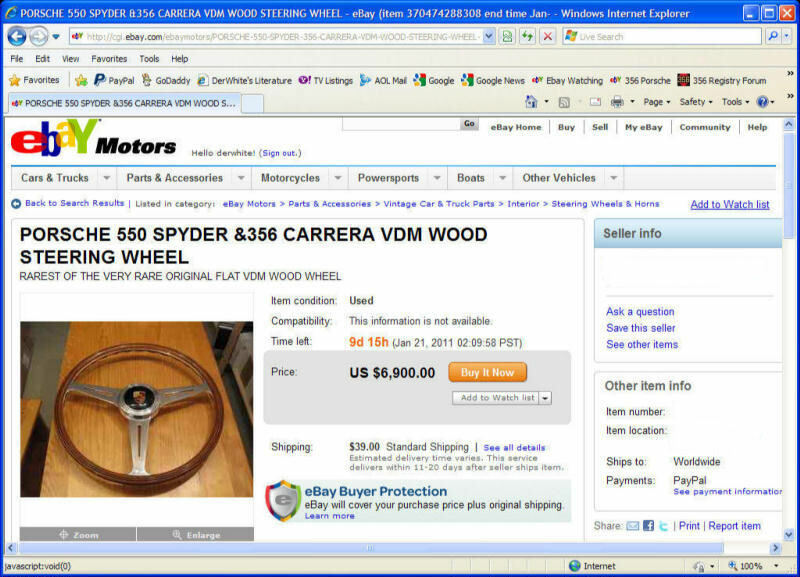 A Steering Wheel that costs more than the car did originally! 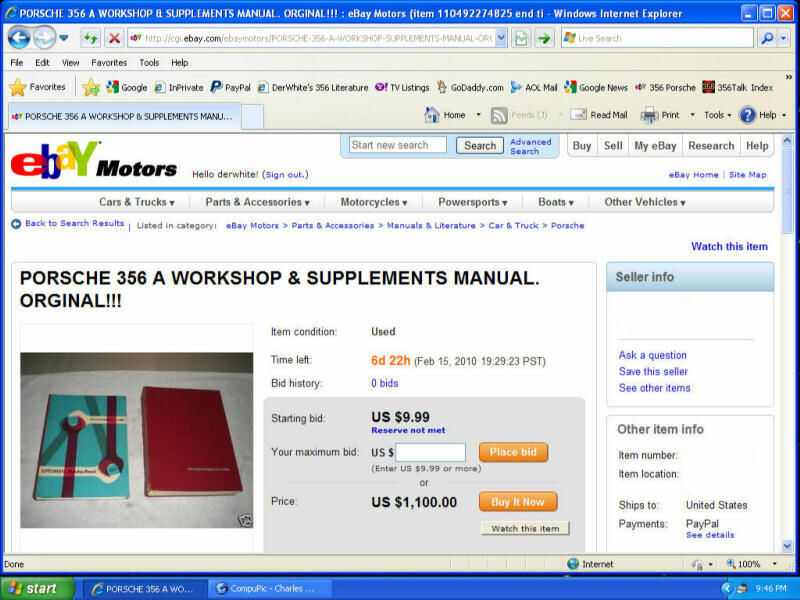 356-A Workshop Manual and Supplement for $1,100.00! 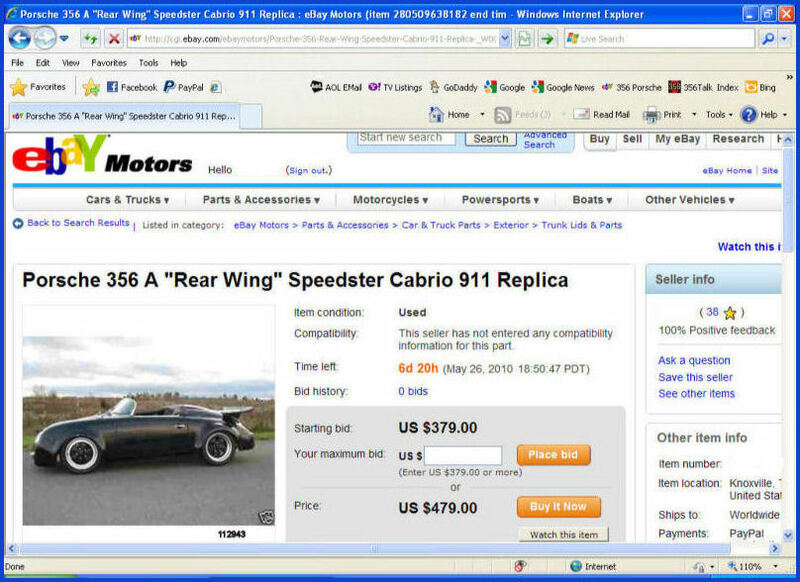 What is a "Speedster Cabrio 911"? 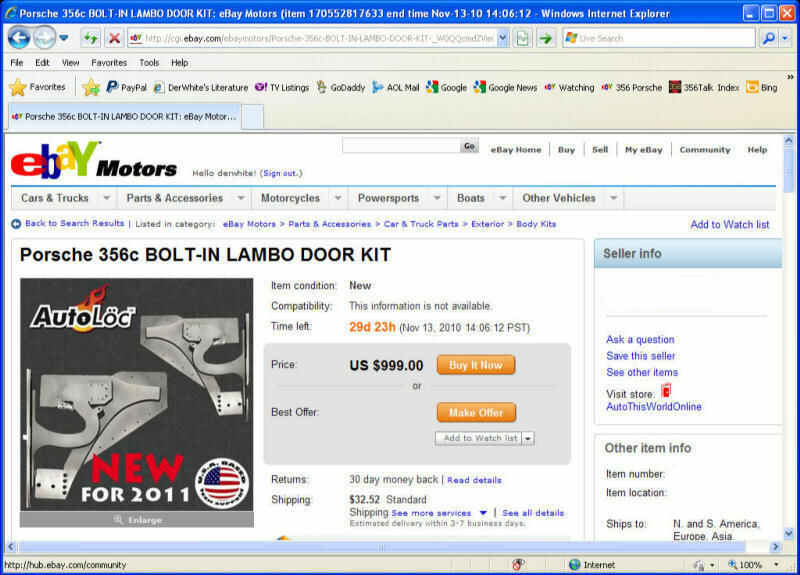 $999.99? 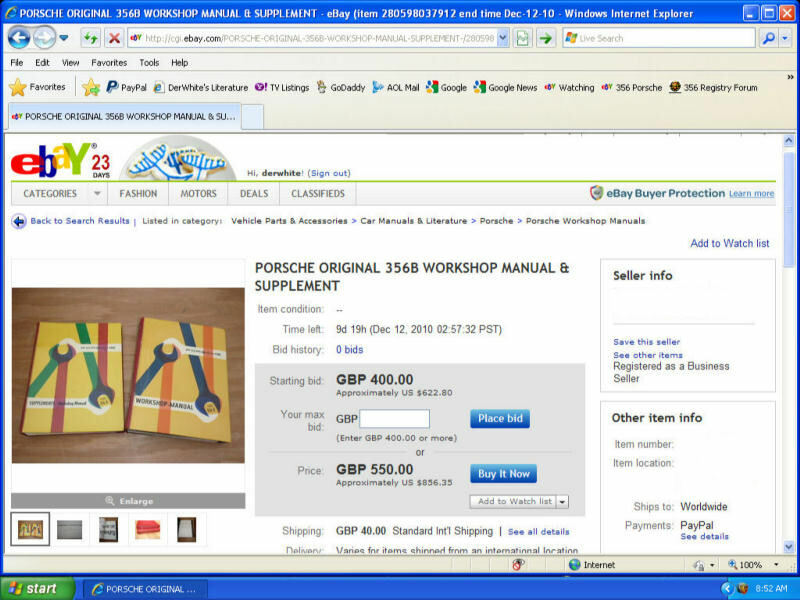 For a 356-B Workshop Manual!!! 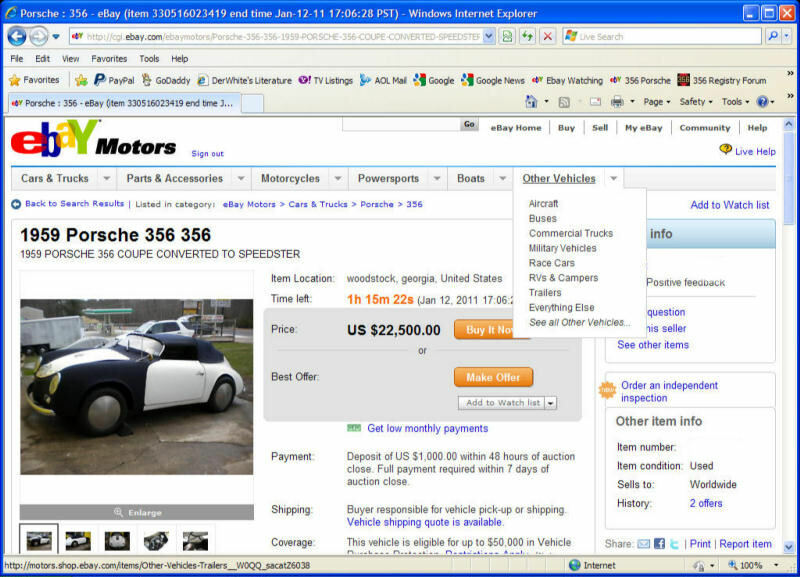 So now there is a Toyota Convertible D? 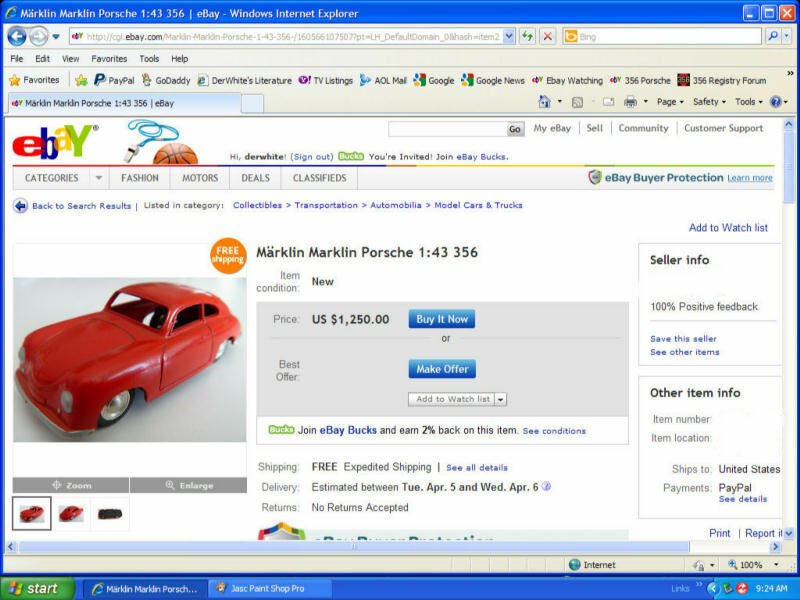 I wonder if any 356 Owner has actually purchased one of these kits.............Maybe for a Plastic Speedster? 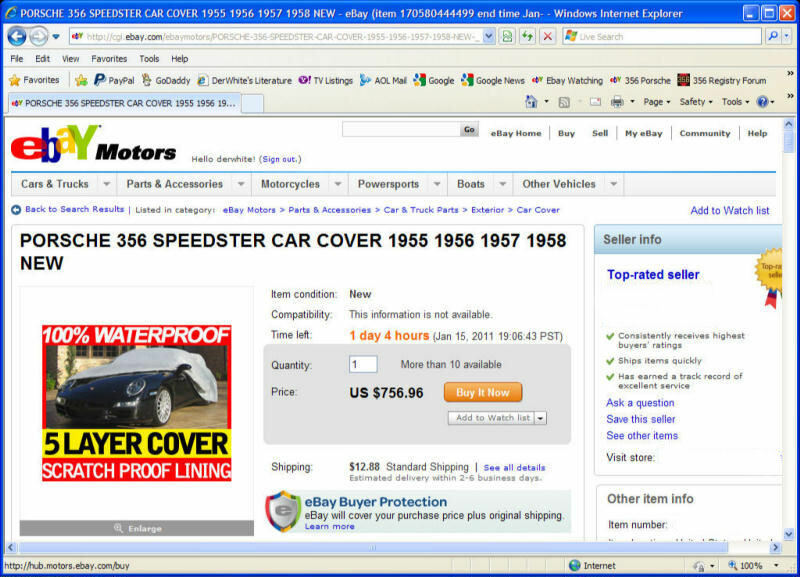 $756.96 for a car cover! 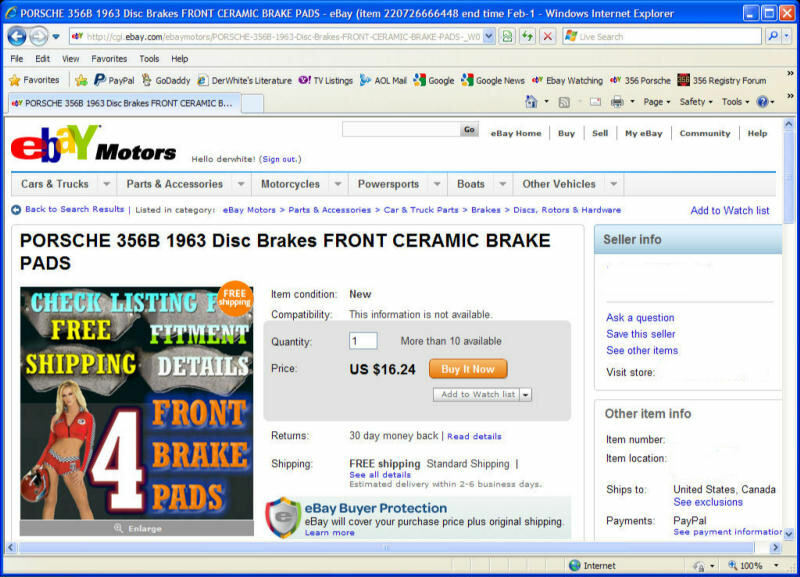 Maybe these are for the aftermarket disc brake kits for 356-B's? I like the blonde! 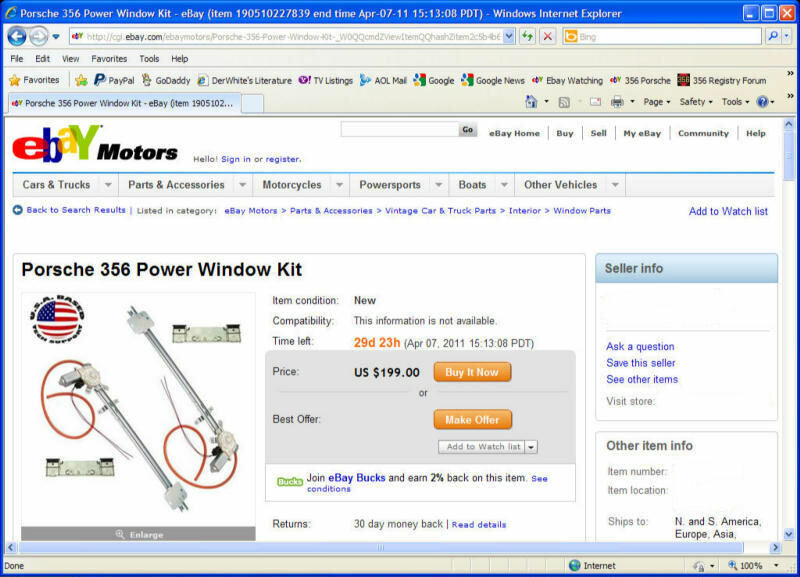 POWER WINDOWS...........in a 356!!! 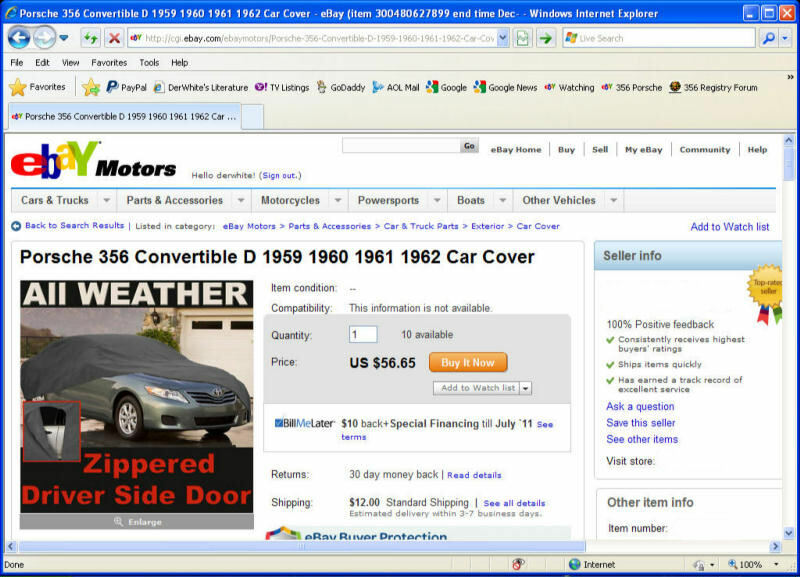 Please show me an example!!! 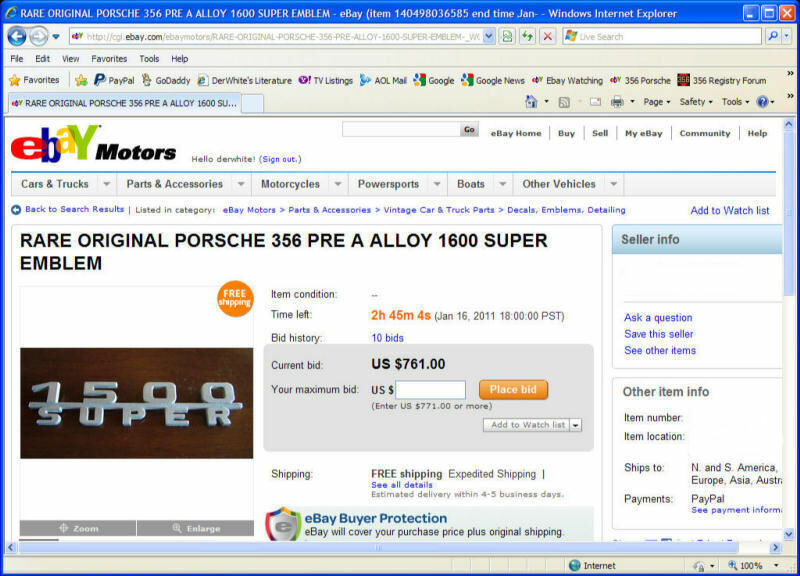 A 1500 Super Script for $761.00! These are hard to find. 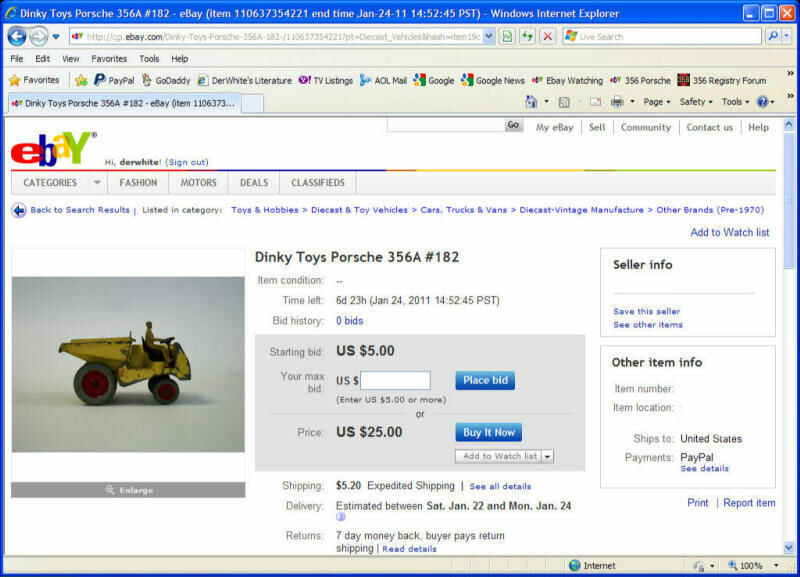 This is a Dinky 356-A Industrial Porsche! 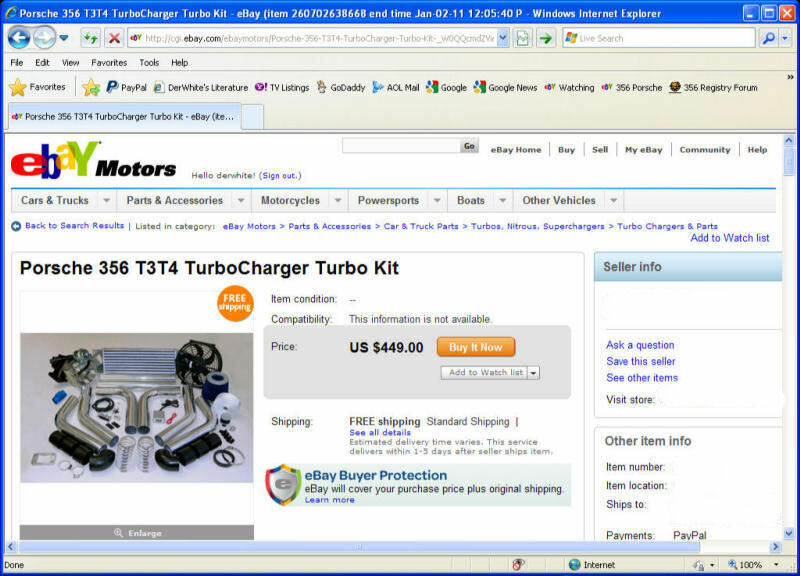 Dedicated to all those avid Ebayers! 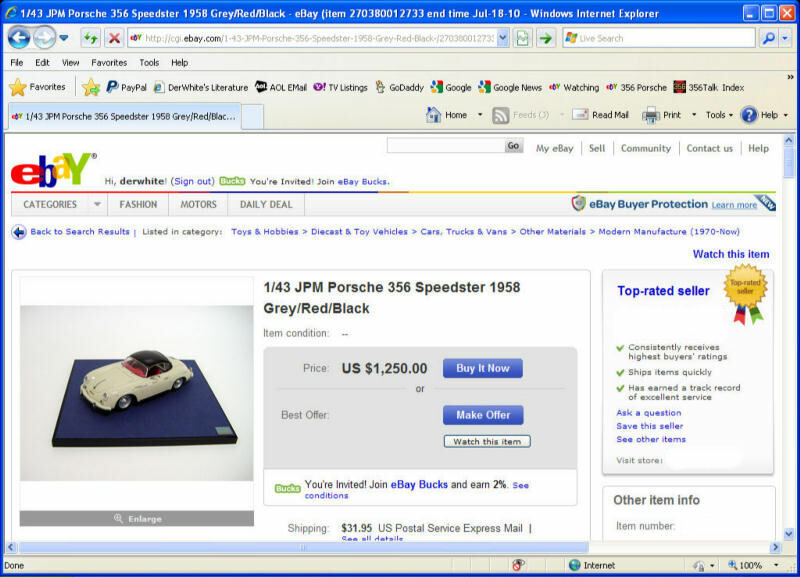 Reporting on the ridiculous and crazy Ebay sales related to 356 Porsches!